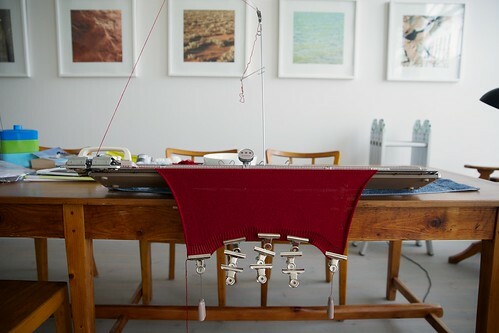 This is a story about a Singer called Yoko (I’m thinking Wantanabe rather than Ono, but...) and three red jumpers I’m knitting for a feature film currently being shot outside Melbourne. Yoko is quite a character. I recently inherited her from my mother-in-law and we’re guessing she’s somewhere between 45 and 50 years old. She’d only been used once until I used her a few years ago to make these jumpers, but that doesn't stop her from being quite a diva. I think the term ‘machine’ on the box is a bit misleading. A machine suggests a certain amount of automation, but there is nothing automatic about Yoko. You have to be very much present, pushing the carriages back in forth smoothly; checking the yarn isn't tangled in the tension head; adding weights to keep the knitting even; and manipulating the latches to shape pieces and create patterns. Lapses of concentration or a diminution of the amount of elbow grease applied are punished by hours spent untangling and re-setting. I like to compare her to an hand egg beater: better than whisking egg whites with a fork, but not as good as a Kitchen Aid. Despite my frequent threats to throw her out into the street there is the sheer joy of being able to knit a hundred rows of stocking stitch in a matter of minutes when operator and machine come together in harmony and creating the most beautiful machine ribbing in minutes when the ribbing attachment with all it’s gadgets function correctly. Soooo...the initial plan was to knit two identical hand knit jumpers for a six year old character and an identical, but larger, jumper for the stunt stand-in. 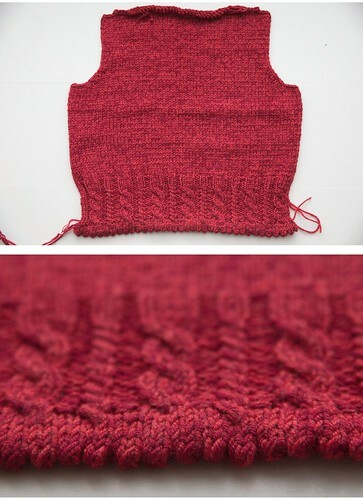 We exchanged several pattern and yarn ideas and settled on Carol Sulcoski’s ‘Briar Rose’ from Knitty Spring 2007. To choose the yarn we first went to the Australian Tapestry Workshop in South Melbourne where there is an astounding 365 colours of 2/13 weight yarn on 25 gram cones (about 180m on each). The initial idea was to twist together two or three colours in four strands to create a tweedy custom DK yarn. 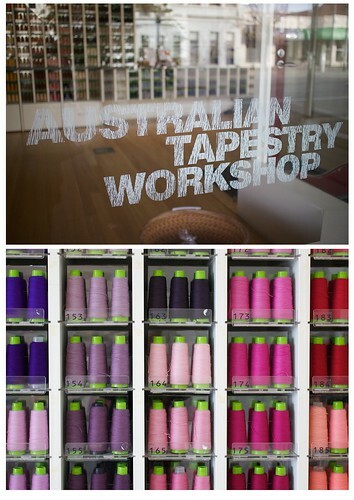 Our second stop was to the Wool Baa in Albert Park. There the girls from production and costume design fell in love with Leonie’s gorgeous hand knits and her Adorn range of yarn. They chose two shades of red (Adorn Silky Cashmerino 4ply China Red and Adorn Silky Merino 4ply Letterbox) to mix together. I quickly knitted up a sample piece to get an idea of how the yarn would mix together although I only had a general idea of the size of the little girl. I submitted the sample piece with my other samples (more on those next time, it is a big knitting list) and there was some concern that it looks a bit to ‘girly’ for a tom boy and that it was a bit to vibrant! We settled on a more old-fashioned look, that of an old school jumper in a finer yarn and using just the darker red yarn, China Red. So I turned to Yoko and the Singer knitting pamphlet which came with her. 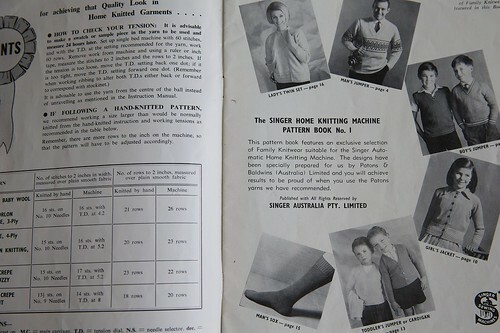 Figure 5: The Singer Home Knitting Machine Pattern Book No. 1, certainly pre-1966 as it cost 4’6. The patterns all use Paton’s yarns and there is a handy chart comparing hand knitting tension to machine knitted tension. I based my design on the boy’s jumpers with the crew neck adapted from the Lady’s twin set. I knitted on whole jumper on a Saturday (excluding the neckband), but I felt that the knitting was too uneven, so I pulled it out on Saturday night and knitted the two smaller jumpers in a 10 hour knitting stint on the following day. While I was knitting away, the film people decided that the necklines might need to be lower. 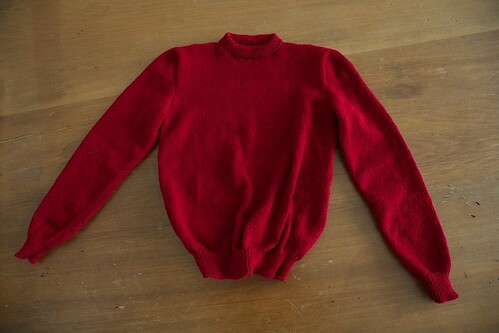 So I finished one jumper; washed and blocked it; and dropped it off as soon as it was dry. 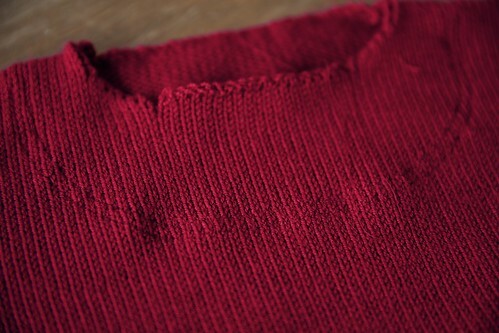 While they considered the neckline, I finished the other jumper. 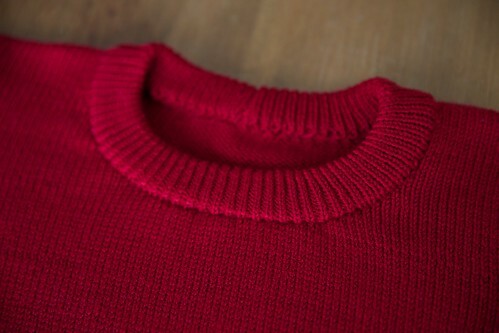 The following Monday morning, the first red jumper came back again with an op shop jumper to give me an idea of the neckline required. Hmm...I worked out that I had three options: start all over again; un-pull the front and back to the appropriate point and knit them up again; or apply the principles of steeking to the neckline and reinforce it on the sewing machine before taking to my knitting with scissors. I dismissed the first option because as the jumpers had been washed and blocked the yarn would be wasted. This also ruled out the second option as I was worried the join would always be visible. That left me with the third option. After all, if it didn't work, I could just start again (gulp!). I took off the neckbands and marked out my new neckline. I hand tacked around it in a contrast yarn so that I could the see the line I needed to sew along on the sewing machine. I then took to my sewing machine, and following these guidelines, and using the straight stretch stitch and matching thread sewed 1/4 inch within my tacking, then removed my tacking and sewed 1/4 inch outside my first stitch line, where the tacking had been. It was nerve wracking, but surprisingly easy. Figure 9: The two lines of stitching. Then I knitted new neckbands on the machine (the first one I nailed first time; the second took four hours and quite a few goes...) and sewed them in. 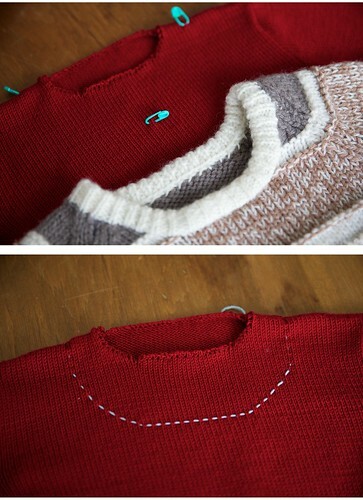 The white waste yarn is the live stitches which you un-pull before sewing down on the inside of the neckband. 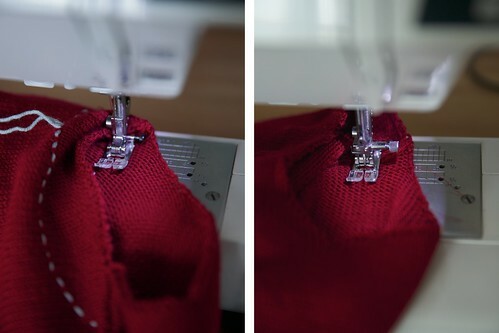 Figure 10: Sewing on the neckband. Then I cut of the extra fabric around the neckline as I wasn't brave enough to do it before I had to and yeah, the stitching held. Be warned, however, you’ll be finding small bits of the knitted fabric everywhere! Figure 11: Cutting away the excess fabric. 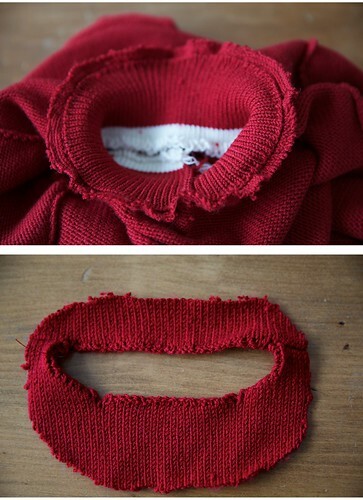 Finally I slip stitched down the inside of the necks; gave the jumpers a good steam and sent them off. 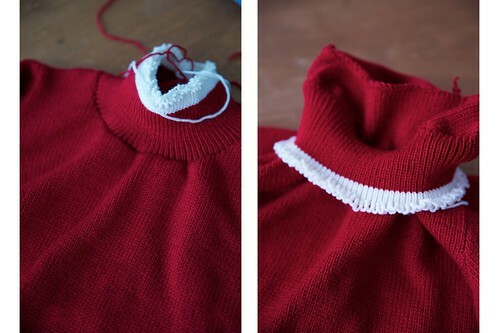 Figure 12: The finished neckband. There is still one red jumper to go, a beanie and two hand knit cardigans, but I'll tell you about those projects next time. 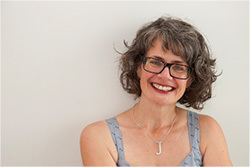 Ms Jane is Melbourne-based artist who earns her living taking photographs and spends it all on knitting yarn and sewing material. You can see her knitting and sewing projects here or find her as msjane on Ravelry. 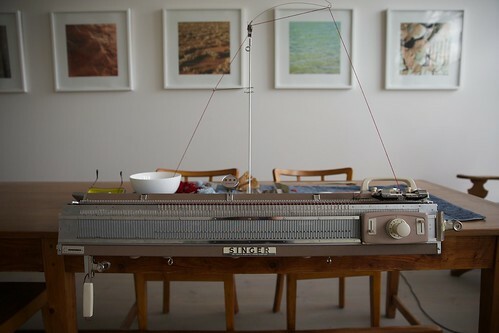 Want to learn how to knit on a machine? Come along to our classes here at Handmaker's Factory! Starting on August 31st we have a series of classes taught by Brianna Read of Jack of Diamonds covering multiple techniques from casting on to casting off a finished project to take home. 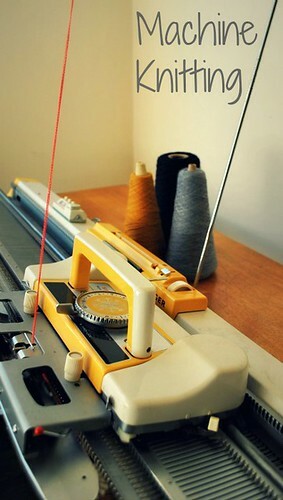 The classes can be booked individually or as a course, machines and yarn are supplied.